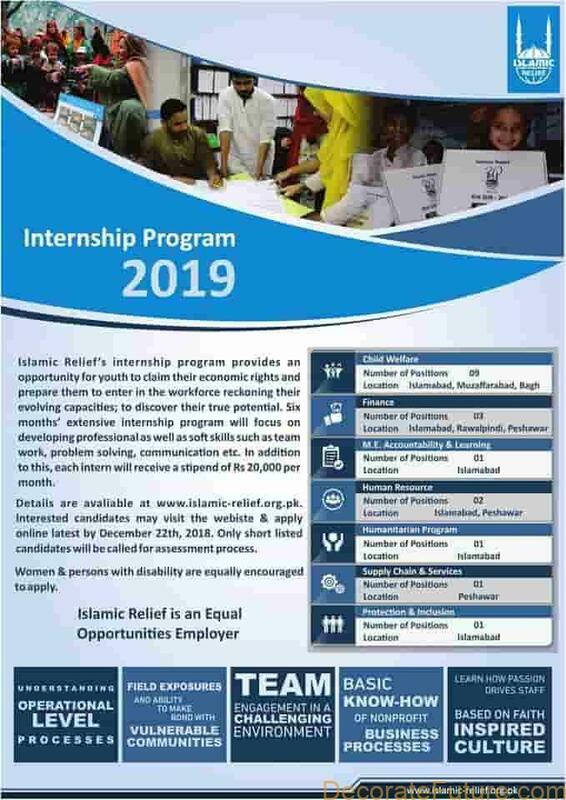 Applications are Required for Islamic Relief Pakistan to fill the jobs and internship vacancies for 2019 batch. Islamic Relief is an international aid agency that has served humanity for over 30 years by striving to make the world a better, fairer place. We remain guided by the timeless values and teachings of the Qur’an and prophetic example. As such, you don’t need to be a Muslim to work for us, but you will need to show a commitment to our faith-inspired values – sincerity, excellence, compassion, social justice and custodianship. Graduate preferably Master Degree holder in social science. Ability to create, composes, edits the field record. Interpersonal and communication skills and the ability to work effectively with a wide range of people in a multicultural community. Knowledge of Social Mobilization principles and procedures. Minimum Education & Experience: Applicant should be MBA-Finance/MCOM/ICMA-Inter/CA-Inter with 2+ years of relevant experience. Maximum Education & Experience: Applicant should be MBA-Finance/MCOM/ICMA-Inter/CA-Inter with 2+ years of relevant experience. Minimum Education & Experience: The candidate should be DAE with 2+ years of relevant experience. Maximum Education & Experience: The candidate should be DAE with 2+ years of relevant experience. Minimum Education & Experience: • Graduate (Master or BS in social science) preferably Sociology, anthropology, social work, political science, development studies, project management, public policy. Maximum Education & Experience: • Graduate (Master or BS in social science) preferably Sociology, anthropology, social work, political science, development studies, project management, public policy.